One of the questions I get really often is what wire-wrapping tools I use, or what wire pliers should a beginner use. So I thought I’d give you my wire wrap tool recommendations! Simple tools are best for beginners – you can get sets of flush cutters, round-nose pliers, and chain-nose pliers at various department or craft stores for five or ten bucks per pair. If you know nothing about tools, just make sure that there are no grooves on the jaws. But as you really start making lots of wire wrap jewelry, you’re going to want to upgrade. First of all, quality tools make working with the wire so much easier. Second of all, it’s far easier on your hands! Here’s a list of the tools that *I* use, and what they’re good for. These are the tools listed in the book – although there’s a bit more information here! These tools are a real investment. You can get by with far cheaper tools – but if you’re at all serious, I highly recommend the upgrade. These are my favourite pliers and I use them for everything – they’re never far from my hands in the studio. 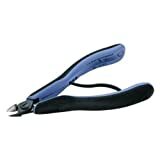 A bent-nose chain plier is useful to get into tiny nooks and crannies, and this particular pair is fine and at a nearly 90 degree bend; this bend means you can get at many angles without corking your wrist out at odd angles. Maybe regular folks don’t mind this, but with fibromyalgia and RSI, my hands thank me every day that I don’t twist them up like pretzels I have a pair of Tronex bent chain nose pliers which are also excellent – the points are longer, letting you get into finicky-er places – but the angle just doesn’t work as well for me; maybe simply because I had the Lindstroms first! My Lindstrom cutters are actually the blue-handled ones, which I think have been replaced with these yellow ones. Make a few cuts with the cheap cutters and you’ll be familiar with the pressure required; every student (and even professionals) I’ve let cut wire with my Lindstroms has been AMAZED at how easy and simple it is to cut with them. They’re not just ultra-flush cutters – which they are, which means you can spend less time filing on thicker wire and avoid it entirely on thinner wire – but they have this magical ability to cut through wire like butter. Just DON’T use them on hard metals like brass when you’re really sleepy, or you’ll ruin them. Trust me. I know this. Don’t ask me how. Recognized by jewelers and craftsmen worldwide, Lindstrom Cutters are unsurpassed in quality materials, design and performance. EURO TOOL, Inc. is proud to be the North American distributor of Lindstrom Tools for the jewelry arts industries. This pair of ergonomic, small oval head cutters has a flush jaw. They have the exclusive Micro-Touch handles that are also slightly rounded and wider for even surface distribution. The exclusive BioSpring reduces spring tension during work which lessons fatigue and hand stress. These cutters are 135.5mm with a 10.5mm jaw length. Maximum cutting capacity is 16 gauge. These are the best round-nose pliers ever for making spirals. Most round-nose pliers have a cut-off tip of several millimetres wide; these ones come to an extremely fine point, which means you can use a really sharp wrist-flick to make a tight, beautiful spiral middle. The long handles on the Lindstroms give extra leverage and they really fit easily into my hands. Flat nose pliers have uses for sure, but I almost never pull these out. I have a set of Wubbers flat pliers as well; I have no preference for either really. I tend to grab them when I need a second pair to open jump rings (the bent-nose pliers are in my other hand, natch), or if there’s a wide hunk of wire I need to tamp down. Definitely worth having but not as essential as the first three. These I use a lot, more than any other of my Wubbers (of which I have MANY) mandrel pliers. The larger size is perfect for, you know, making integrated bails (which is covered in the book ) and I use both sides for my separate Handmade Bail. Part of the Wubbers Designer series, these unique pliers are comfortable and versatile. Handcrafted for superb quality and engineered for comfort and control. These pliers will easily make consistent and even coils, loops and bends. 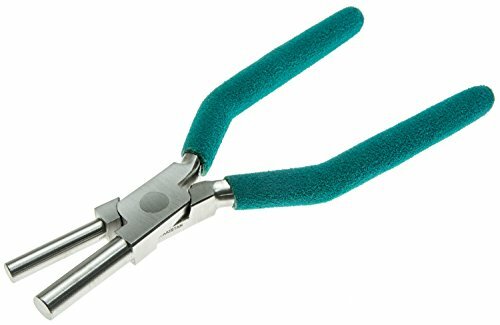 Large size bail making Wubber pliers for use with wire 12 gauge or finer. The plier tips are uniform cylinders, so you get uniform loops every time. Measurements: Two jaw sizes, 7mm and 9mm. Pliers are 5 1/2 Inch long. NOTE: These pliers are intended for beading and other fine hobby work. Not recommended for heavy duty applications such as automotive, home improvement, or maritime use. Those are the major sets of pliers that I use on a daily basis. What wire wrap tool set do YOU like? Full Disclosure: each of these links is carrying my Amazon affiliates link. No need to use these links if you don’t want to – but you should know that if you do use them to order your pliers, a few pennies will be sent my way by Amazon.